As you may know, the gallery was originally conceived as a pop-up experience, living in a converted warehouse that was slated to be torn down. 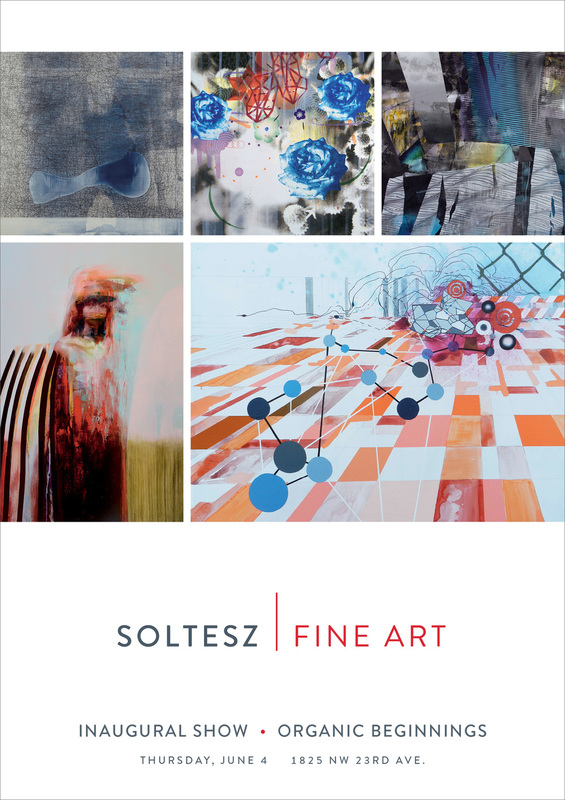 After an incredible year that time has come and Soltesz Fine Art is looking to the future. It has been a wonderful adventure and a perfect introduction to the Portland art scene. I want to personally thank you for your support of the gallery over the last year and joining us for all our events. Soltesz Fine Art will continue providing appraisal and advisory services, as I have for the last 20 years. There are some other very exciting new ventures on the horizon as well. Stay tuned, it won't be long before you see me again! Congratulations to Chris Trueman who was juried into the Pacific Coast edition of New American Paintings. The Issue #121 is out and available now so go grab a copy! Feel free to contact the gallery if you can't get your hands on one, we'll take care of you! Soltesz Fine Art welcomes Seattle based artist, Polina Tereshina to the gallery. Tereshina will have seven new figurative paintings hanging for our first Thursday opening, on November 5th. Please stop by and meet the artist. For our second class in our summer yoga series, Yoga IN will be guiding our practice in the gallery, surrounded by our new art installation from Danielle Wyckoff! The class is donation based and the organization that inspires our practice changes for each meeting. Our upcoming class will be benefiting The Hilary Benevolent Fund. The fund was started by the mother of Yoga IN's Irene Laney, after her sister passed away from Leukemia. The fund was established to assist in covering the related expenses associated with seeking medical treatment. There are countless addition costs that insurance doesn't cover; the funds raised will go toward things like transportation, food, and lodging, in order to help lighten the load for family members. For more information click here. Please join us and the ladies of Yoga IN Saturday, August 15th at 8:30 am. All levels are welcome - bring your friends! Yoga surrounded by an art installation, it's sure to be a first for everyone! Soltesz Fine Art welcomes Bay Area artist John Wentz to the gallery! Check out his new work. Soltesz Fine Art is teaming up with Yoga IN to offer a summer yoga series in the gallery. The classes are donation based and the organization that will inspire our practice will vary each class. Our first class with be benefiting Teisha's House. Teisha's House is a Portland based organization that helps lessen the financial burden of medical treatment by offering families a fully furnished home to live in while they recover and receive medical treatment in the Portland area. To learn more about Teisha's House click here. Please join us and the ladies of Yoga IN Saturday, June 20th at 8:30 am for our first class. All levels are welcome - bring your friends! Can you think of a more inspiring way to start your Saturday? Organic Beginnings featuring work by Zin Lim, Paul Lorenz, Heather Patterson, Heinrich Toh, Chris Trueman, and Danielle Wyckoff. Danielle Wyckoff was awarded a large scale public art commission for the Park City, Utah public library. Surroundings, the site-specific, permanent public art piece, will be installed at the end of June 2015. The piece consists of multiple screenprinted panels that incorporate stories of Park City, told by Park City residents. The screenprinted stories create a mountain-scape that refers to how we collect information, internalize knowledge, and how this collection, as well as our community, composes our understandings of ourselves and our surroundings. The installation has a secondary element including metal discs which refer to the city's history as a silver mining town as well as the dynamic weather of the area.